I received this book from the publishers on Netgalley, and was intrigued to read it. 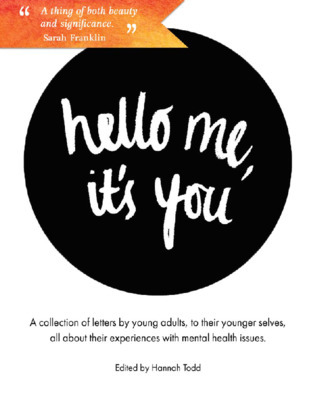 It is a collection of letters from young adults, up to 24 years old, writing letters to themselves at 16. There's a particular emphasis on mental health issues, which I have suffered from myself since I was a very young child. I was finally diagnosed with depression when I was fourteen and started on medication and with some counselling. I was further diagnosed with anxiety when I was seventeen, and I have struggled on and off with that ever since. At the moment I'm doing really well and am unmedicated, but I've had a lot of counselling, a lot of medication, and I struggle. I would ask for help again if I needed it, no doubt. The book raised money for the charity of the same name, details of which can be found here. It is a really worthwhile cause! My own mental health history meant that I was really interested to read this book, and I really liked it. A lot of the stories were really touching and often quite difficult to read. It got me thinking about what I would write to myself, even though I am over twice that age. I lost my dad when I was 24, so I think I would warn myself about this, since I would have so few years left with him. I would probably tell myself that even though I still struggle with my mental health, I have a lot more confidence in myself and care less about what other people think about me. I would tell myself to get serious about my writing quicker than I have. I can't give this book anything less than five out of five, because of the subject matter and because of the open and heartfelt way so many people shared intimate details of their lives. Thank you to all the writers, you are all amazing humans.